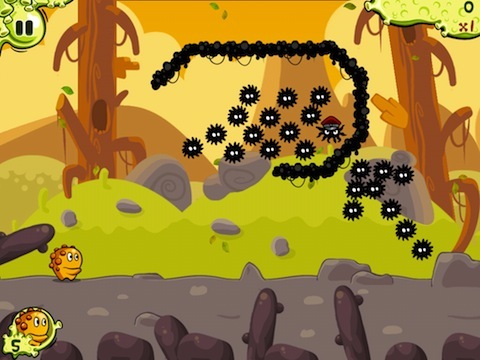 Snoticles is an Adult Swim iPod Touch, iPad and iPhone app where you use four different characters to destroy the “Blot” or black little creatures that are trying to take over the world. This application is very fun, but read on to see if it fits your gaming preferences, or if it is best left off your idevice. The Blot has taken over and you have to take them down. 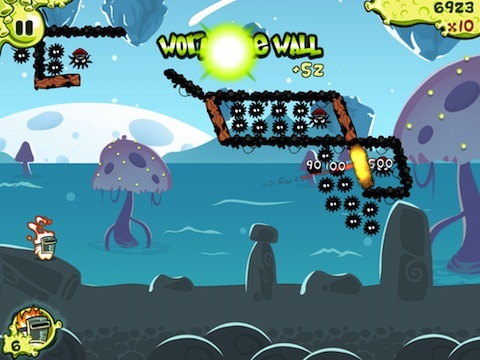 You get four different character, and each one shoots a different projectile that can bounce of walls, burn substances or destroy weak wall parts. You have to use each of the four characters, especially in the later rounds, to beat each level. To beat the level, you don’t have to destroy every Blot, you just have to destroy the Alpha one. You can tell him apart easily because he is wearing a red hat that looks suspiciously like M. Bison’s hat from Street Fighter. You only get a limited amount of ammunition for each round, so be sure you aim correctly and take out the leader. The controls are easy to learn, but getting the shot right can sometimes be difficult in this game. You select a character by either tapping his icon or the character himself. Then, use your finger to angle the arrow (where you will be shooting) and move up and down to adjust the power of the shot. When you are ready to fire, hit the character’s icon again. Do your best just to hit the alpha, as this will destroy the other Blots and will give you a big score bonus. To switch between characters, just click another character’s icon if they are available for the round. If they are not available, then you cannot switch. You can also move the background by putting two fingers on the screen and moving in a direction, or you can zoom in or out by taking two fingers and squeezing them together or pulling them apart. Like most of the AdultSwim games, Snoticles is stylized and looks cartoonish. However, this stylization looks great with the settings, and the characters look perfect. You can easily attach yourself to any one of the characters. The backgrounds are also very crisp and easy to see. The background music in Snoticles is very fun to listen to and its slightly adventurous beat fits in perfectly with how the levels look and feel. You may end up liking this game just because of the track. Snoticles is a very fun iOS game from Adult Swim and you will get hours of fun out of this app. Between the different characters and the difficult puzzles, difficult in the later stages at least, you will be challenged to a fun degree that does not become too annoying. AppSafari review of Snoticles was written by Joe Seifi on December 21st, 2011 and categorized under Adventure, App Store, Featured, Fun, Games, Puzzler. Page viewed 4665 times, 2 so far today. Need help on using these apps? Please read the Help Page.